June 13, 2013 by Penni Holdham, C.S.E.P. The ROI of special events and meetings is often measured by the financial outcomes reviewed at the conclusion of the event. To achieve a positive outcome, it is essential to accurately project costs and monitor the budget assignment throughout the event delivery process. 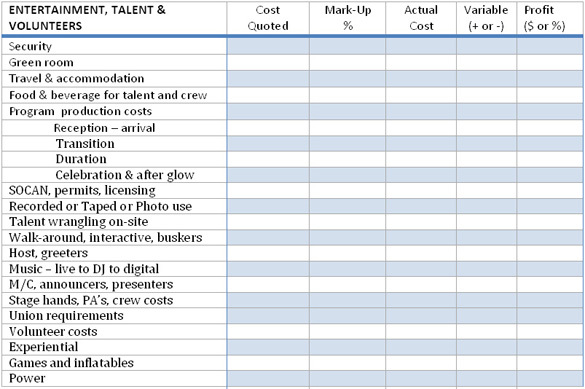 When tackling the preparation of the event budget, each discipline within the event has its own set of cost variables unique to the specified product or service. The following lists provide a foundation from which to build event-specific budget templates demonstrating costs and projected income within each event track. Depending on the scale of each project, these cost areas will shrink or grow relative to the financial parameters suggested and the scope of services required to implement the event vision. This entry was posted in Event Budgeting, Event Operations and tagged budget template, event budget, event budgeting.